What family historian doesn’t love a mystery? Of course, it’s nice to solve one from time to time! I’ve been mulling this one around for awhile, and thought I’d reach out to you, my readers, for help. This unidentified tintype was passed down from my grandmother, Wilma Steele Herrel. Wilma inherited some photos of her King and Steele relatives from her grandmother, Minnie King Steele. As I wrote last week, Minnie was the daughter of Civil War soldier Newel King. I’ve long wondered if he is the man pictured in this tintype. Tintypes were introduced in 1855 and hit their peak of popularity in the 1860s and early 1870s, in the decade surrounding the Civil War. Gary Clark of PhotoTree.com, who I spoke to at the 2013 FGS Conference in Ft. Wayne, notes on his website that tintypes produced into the early 1860s were usually enclosed in metal cases. But as they became more popular and less expensive, paper sleeves or envelopes replaced the cases. This one looks as though it might have had a case around it at one time. Perhaps someone removed the case in hopes of finding a name or other identification. Newel King was born 17 January 1838 in Gallia County, Ohio. (1) He would have been 22 years old in 1860. The young man in the tintype looks to be in his twenties to me. The long side hair is a particularly distinctive feature. I’ve noted other men with similar hairstyles in Maureen Taylor’s book, Fashionable Folks Hairstyles 1840-1900. 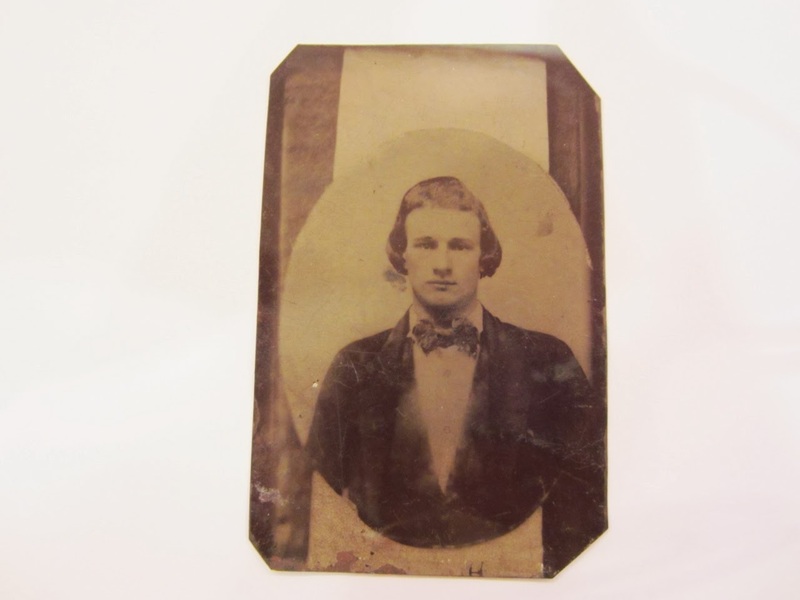 I’ve also found examples of similar cuts on men in the 1860s in the Family Chronicle publications, Dating Old Photographs 1840-1929 and More Dating Old Photographs 1840-1929. The examples seem consistent with a young man about 1860-1865. My working theory is that this is a photo of Newel King of Gallia County, Ohio, taken before he mustered into service for Co. B, 91st Ohio Volunteer Infantry, in September 1862. The age seems right, the hairstyle seems right, and the type of photograph is definitely right. In addition, there was the added motivation for a young man going off to war to have his picture taken to leave behind with his mother or girlfriend. Newel King not only survived the war, but lived until 1896, although he suffered from epilepsy and declining health. This means it’s very likely that there’s another photograph of him, somewhere out there (cue to song lyrics now going through my head). A picture might also include his wife, Electa Roush King, and/or children Wesley Berlin King, Curtis Walden King, Minnie L. King Steele, or Bella King Stickelman. If you think you might have one, please get in touch with me and let me know by emailing me at the address under the mailbox in the sidebar or by leaving a comment below. And if you have any tips or thoughts for dating or identifying this tintype, I’d love to hear them. Maybe by working together we can wrap this mystery up! (1) Ohio Gravestones, database and images (www.ohiogravestones.org: accessed 8 Sep 2010), data and gravestone image for Newel King (1838-1896) and Electa King (1845-1932), contributed by W. A. Anderson on 23 September 2009, citing Gravel Hill Cemetery, Gallia County, Ohio. This is one of a series of family history stories written for “52 Ancestors in 52 Weeks,” coordinated by Amy Johnson Crow, CG, author of No Story Too Small. Some little girls like getting all dressed up in stiff crinoline skirts and fancy velveteen dresses, with bows in their hair and shiny new shoes. Let me say for the record right here that I wasn’t one of those girls. Apparently, I gave my mother quite a hard time when she tried to make my little toddler self look appropriately elegant for a once-in-a-lifetime family photograph. I was not impressed. Then. 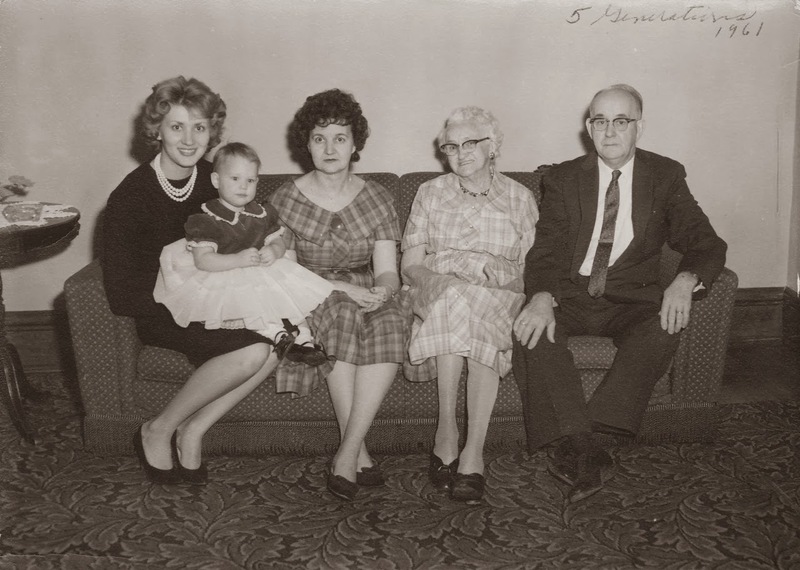 The idea to take a five-generation picture started with my grandma, Wilma Steele Herrel. She wanted a photograph that included her own grandmother, Minnie King Steele, as well as her young granddaughter. It was timed around some family occasion—perhaps her own September birthday—in 1961. My mother remembers that on the appointed day, everyone gathered at the home of Wilma’s father, Homer Steele, in Columbus, Ohio. She thinks Wilma’s brother-in-law, Merle Rhoten, a professional photographer, most likely took the picture. And so, a moment in time was captured. Five Generations, 1961: from left to right, my mother, holding me; my grandmother, Wilma Lucille Steele Herrel; my great-great-grandmother, Minnie L. King Steele; and my great-grandfather, Homer Burdell Steele. I have no memory of my great-great-grandmother, but clearly she knew me, and today I marvel that our lives overlapped. Minnie L. King was born November 23, 1873, in the town of Cheshire in Gallia County, Ohio.1 Her father, Newel King, was a Civil War veteran, having served in the 91st Ohio Volunteer Infantry, Company B. Her mother, Electa Roush King, was descended from a line of Roush patriots from Virginia’s Shenandoah Valley. Mom remembers Minnie as being a really nice person, always friendly, cheerful, and optimistic. She was an impeccable and fashionable dresser, with a good sense of style. A cute little black terrier was her constant companion. To think that I was held and loved by someone born in 1873, the daughter of a Civil War soldier, amazes me now. Minnie is the oldest ancestor in any of my family lines that I've actually known. She was the only great-great-grandparent still alive when I was born. At the time, of course, I had no inkling of the family history that one photograph could represent, or how much it could mean to me decades later. I just wanted out of that stiff, scratchy skirt. Gallia County, Ohio, Birth Records, v. 1: 117, no. 13, Minnie King (born 1873); Probate Court Office, Gallipolis. Meigs County, Ohio, Marriage Records, v. 9: 102, George Steel and Minnie King (1893); Meigs County Museum, Pomeroy. 1910 U.S. census, Columbus Ward 1, Franklin County, Ohio, population schedule, ED 37, p. 2B, dwelling 40, family 41, George P. Steele; digital image, Ancestry (www.ancestry.com: accessed 18 August 2009); citing NARA microfilm publication T624, roll 1180. Ohio Department of Health, death certificate no. 86054 (1961), Minnie L. Steele; Office of Vital Statistics, Columbus. 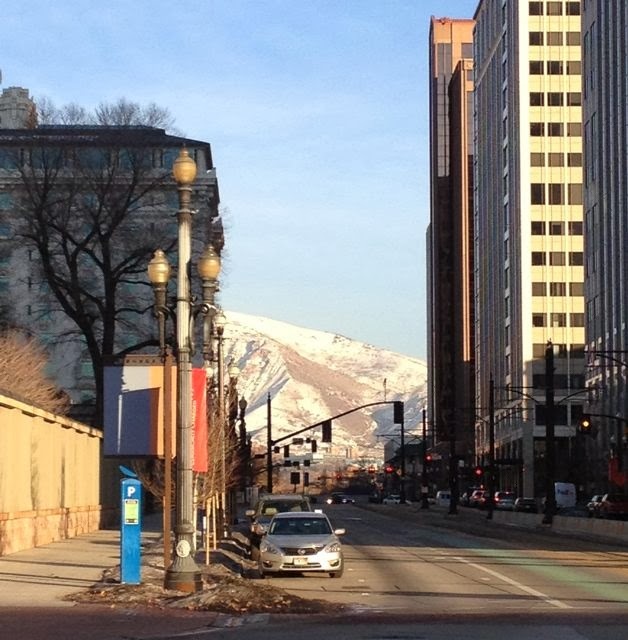 RootsTech 2014 was at the center of the world genealogical stage last week, and even those who couldn’t make it to Salt Lake City were invited to watch. I had a lot of fun following along from home, and just want to say thanks to everyone who made that possible. First of all, hats off to FamilySearch for hosting RootsTech and giving everyone free live access to the keynote addresses, 15 sessions, and syllabus. Well done! The quality of the live streaming was amazing from the opening moments on. It was neat having the Twitter feed streaming on the home page as well. I only noticed a few glitches in the transmission and schedule; perhaps a small announcement board would help keep everyone updated. Overall, what a remarkable production. Thanks to those at FamilySearch with the vision to reach out to home viewers, and to the technicians working behind the scenes. Thanks also to the corporate sponsors of RootsTech for their funding and support. I can’t imagine how much it costs to put something like this on. A big thanks to the many bloggers in attendance who shared their pictures, experiences, thoughts, and discoveries with us. Your posts really captured the essence of RootsTech. 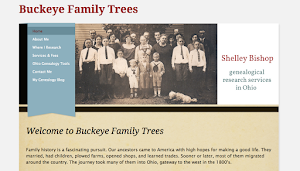 A major genealogy conference is a whirlwind of activity, and I know how difficult it can be to carve out time to write blog posts. But you all did a great job, and your efforts are really appreciated. I look forward to reading more of your recaps and reflections this week. 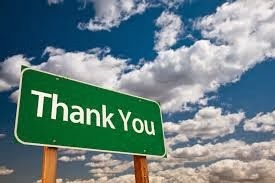 Thanks to all those who kept up the lively exchange of ideas, news, links, and messages on Twitter. It was a fun way to join in with RootsTech. I felt connected to others watching from home, and particularly enjoyed hearing from people at the conference who were attending different sessions. Michael LeClerc recently posted an updated handout for his session, “Sharing Your Family Using Multimedia.” This session wasn’t able to be streamed as scheduled, but the video is online now. If I had to pick one highlight of my virtual RootsTech experience, it would be Friday morning’s keynote address with Judy Russell and Spencer Wells. Judy, The Legal Genealogist, eloquently made the point that we run the risk of losing family history stories in just three generations. We need to purposefully and accurately record our family stories—starting with ourselves, our parents and grandparents—in order to preserve them. As Judy points out in her corresponding blog post, genealogy standards give us the framework we need to do this. Spencer Wells discussed the use of genetic testing to pick up the trail of our deep ancestry after the paper trail of traditional genealogy runs out. If you didn’t get the chance to hear these captivating speakers the first time—or if you’d like to hear them again—you can catch the video here (there aren’t any handout materials for the keynote sessions, in case you’re wondering). I hope everyone involved with RootsTech gets some well-deserved rest now that the conference is over. From my seat in the virtual gallery, it was wonderful to be able to learn and share a little bit of the experience with you. One of the biggest genealogy events of the year, RootsTech 2014, is about to start. 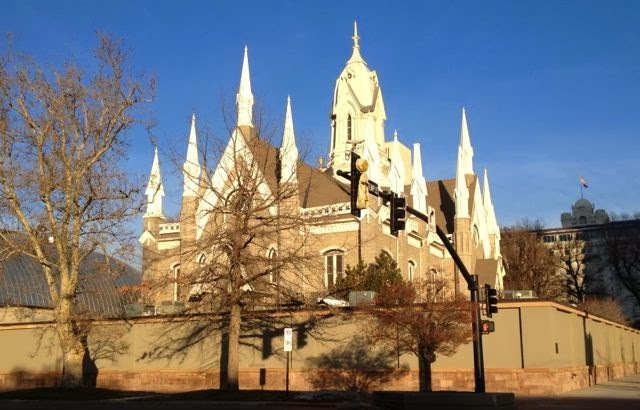 Hundreds—possibly thousands—are gathering in Salt Lake City right now, gearing up to hear presentations, tour the exhibit hall, watch demonstrations, and grab a little research time at the Family History Library. And I’m at home, 1522 miles away. Instead of sitting around feeling sorry for myself, though, I’ve decided to become a Virtual RootsTech Attendee. Would you like to join me? It’s fun, it’s easy, it’s free, and at the end of the day, you get to sleep in your own bed. Doesn’t sound so bad now, does it? 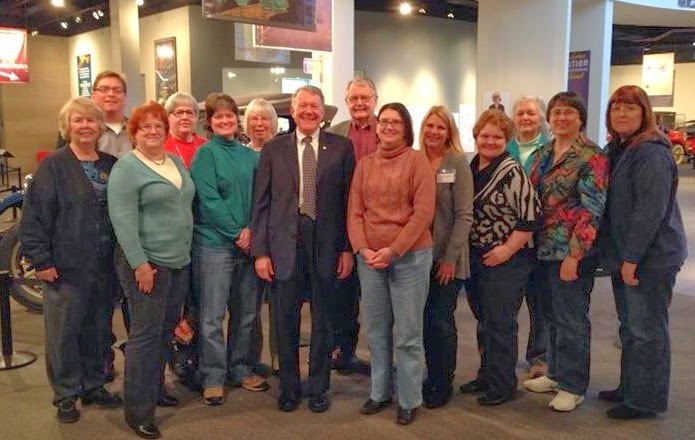 Genealogy bloggers attending RootsTech, who are posting updates, summaries, and news. I’m watching Randy Seaver at GeneaMusings, Amy Coffin at We Tree Genealogy, DearMyrtle, and several others. Twitter, where everyone is using the hashtag #RootsTech. I use TweetDeck to organize my Twitter feeds, and set up a column for the conference (click on the searchlight, enter #RootsTech, and click “add column”). By reading and retweeting other people’s tweets, and posting some of your own, you can actively engage with people at RootsTech, as well as others watching from home. Bookmark the website, www.rootstech.org, for fast access. The videos will appear on the home screen as they’re broadcast—you don’t have to sign up or select anything. Set up a viewing and note-taking system that works from you. For simplicity, you can’t beat watching the sessions on your computer or tablet and taking notes on paper. If you have two screens to work with (an extra monitor, or a tablet in addition to a computer), you can use one to watch and the other to take notes in a Word doc, Google doc, or Evernote note. Download the handouts for the sessions you’re watching. I like to add the handout for the presentation to the notes I take on Evernote. 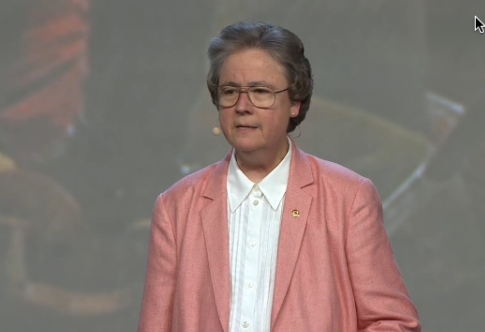 Preview the entire RootsTech schedule, so you’ll know what people are talking about when they reference other sessions that aren’t being streamed. Tune in at 8:30 am MT each day to hear the keynote speakers. 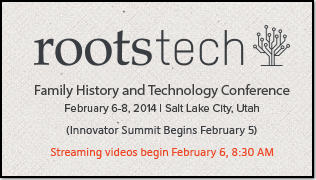 RootsTech doesn’t include these in the list of streamed sessions, but they will be broadcast live. Between sessions, get up and move around. People at RootsTech will be navigating stairs and hallways, changing rooms, grabbing a snack, etc. I plan to change rooms from time to time, too, to keep from getting tired. Have some healthy snacks ready. I’ve got apples, yogurt, and microwave popcorn just waiting to be popped (good thing, because I happen to be snowed in today). Don’t sweat it if you have to miss a session you want to see. Last year, they posted all the videos afterwards, and I expect they’ll do the same this year. Within a few days, if not immediately, you’ll be able to go back and watch them. Keep a lookout for special promotions and offers announced from vendors at RootsTech. These are usually available from home, too, for a short period of time. Sounds too good to miss, doesn’t it? I'm excited! So what do you say? Are you ready to be a Virtual RootsTech Attendee?